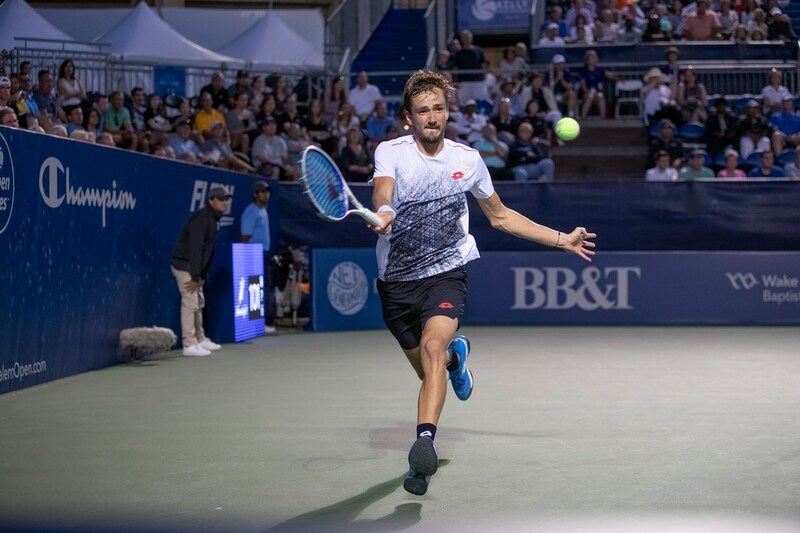 Daniil Medvedev almost didn’t come to this year’s Winston-Salem Open. Then he thought he was going to be an early-round casualty. But the 22-year-old Russian wound up as the last man standing late Saturday afternoon, as he defeated Steve Johnson 6-4, 6-4 on Stadium Court to claim the 2018 WSO title. It was Medvedev’s second ATP World Tour title of the year and it concluded an impressive week in which he never dropped a set. Medvedev, known affectionately as the “Mini-Bear” with his 6-6 frame, got the only break of the first set to go up 5-4, and then he served out the set from there. He got his second break in the seventh game of the second set for a 4-3 lead and then held twice the rest of the way. He credited his serve as the difference-maker. "I was little tight the whole match," Medvedev sid. "It's a fina, of course I would be tight. He was maybe a little tired. Maybe that's why I won. The thing that helped me was I was serving good. That was the most-important thing in the match. I think that's why I won it." Medvedev had started the tournament with a win over Basic, then beat DeMinaur, Guido Andreozzi, Ryan Harrison and Tara Daniel in succession to reach the final. Interestingly, he beat DiMinaur for the Sydney title in front of a pro-DiMinaur crowd of Aussies; and Saturday he prevailed despite a very pro-Johnson crowd. Johnson was looking to become the first player this year to win titles on three different surfaces. He won in Houston onclay this spring and started the summer with a win in Newport on grass. Johnson, the tournament’s No. 8 seed, had defeated Tommy Paul, Jaume Munar, third-seeded Kyle Edmund and second-seeded Pablo Carreno Busta en route to the finals.